Fei lives in a dangerous world. Everyone in her village is deaf, and living on a rocky mountainside prevents them from getting supplies. They rely on a zipline to bring them food and supplies from a nearby village. But when the villagers also begin to lose their sight, they fear they will no longer be able to produce goods to trade for the food they need to survive. One day, Fei is awoken by a sound. Suddenly she is able to hear, and she may now be the only one who can save her village. Ugh. This book could have been so amazing, but it fell so, so flat. Before its release, Soundless was hailed as a unique standalone novel steeped in Asian culture and mythology. Add in the fact that it is about an entire village of people who have lost the ability to hear (and later see), and you have a novel that sounds absolutely fantastic and inclusive. Well, that is unfortunately not the case. I only listened to about one third of Soundless, but from other reviews I have seen, I feel that my analysis of this book is still accurate. First of all, with the exception of the character names, there is absolutely no indication of Asian culture in this book. (I believe it is supposed to occur in China, but I am not positive.) Replace the names and this story could have occurred anywhere in the world. This was such a disservice to Asian mythology and culture, which is vibrant, unique, and so interesting. This was a lost opportunity to explore a culture that is not displayed nearly enough in our current young adult literature. Another disappointment in Soundless was the way that hearing and sight impairment were handled. Firstly, there was no description of how the villagers learned to alter their daily lives to adjust for their hearing and sight. Typically, those with one sense impaired learn to rely more heavily on the other senses, but there was no description of this in the book. The most disheartening thing was that Fei regained her hearing and was therefore able to save the village. Why did she have to get "fixed" to be our heroine? Again, a huge opportunity for inclusivity was lost with this plot line. In addition to these huge slights, the writing was also poor and the world was undeveloped. The society is divided into three groups - artists, suppliers, and miners. What type of society could possibly survive with only those jobs? There was no explanation of why these social groups were created or how they managed to keep the village running. Also, how did this village get so separated from society? When they started losing their hearing, why didn't they travel down the mountain while it was still safe to get help? Why don't the people at the bottom of the mountain help them? There were so many unanswered questions and so many plot points that didn't make sense. Typically when an audiobook is short enough, I will listen to the entire book instead of giving up. 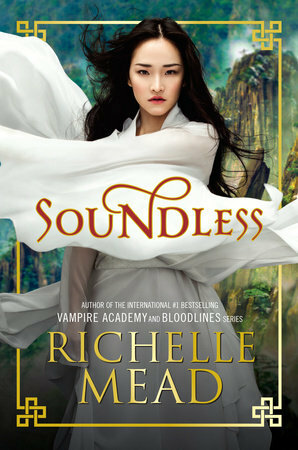 Soundless was very short, but I just could not continue reading. There were too many problems with this book and it was too boring to push forward. After my experience with this book, it may be a while before I try Richelle Mead again.